Global mosaic of Visual and Infrared Mapping Spectrometer (VIMS) images acquired during the nominal and equinox Cassini mission. Differences in composition translate into subtle differences of colors in this mosaic, revealing the diversity of terrains on Titan, such as the brownish equatorial dune fields or the bright, elevated terrains. 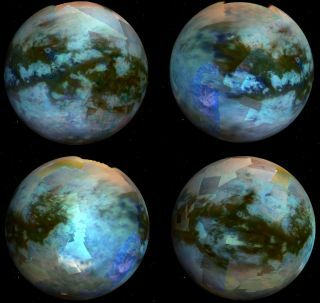 Observations of the northern seas of Titan by Cassini's Visual and Infrared Mapping Spectrometer, or VIMS, (left and center) and by RADAR (right).